The Revell Vostok was the first production model kit of the Vostok and largest model of the ship I've seen to date. 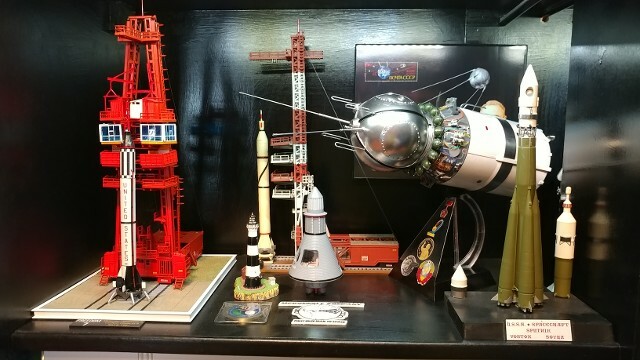 This model commemorates the flight of Soviet Major Yuri Gagarin and Vostok 1 on April 12, 1961, making him the first man to orbit the Earth. 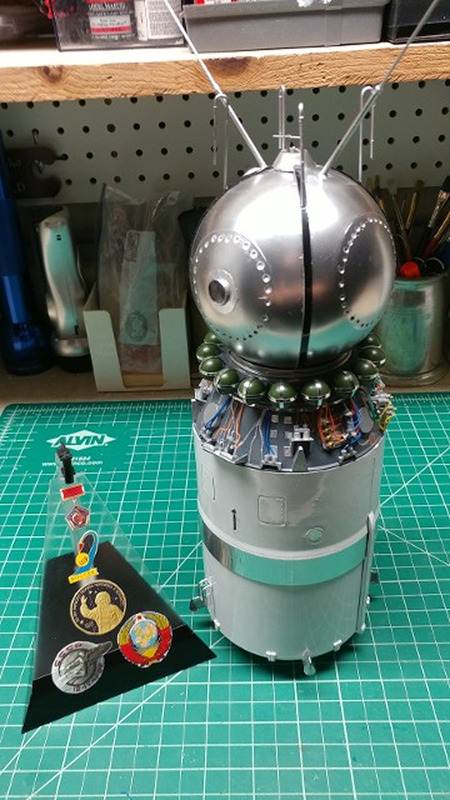 The model below was originally built in the 1970s and remained in that condition until the exterior restoration work of 2012, when the white third-stage exterior paint was done, along with restoring of all whip and loop antenna on the Vostok itself. 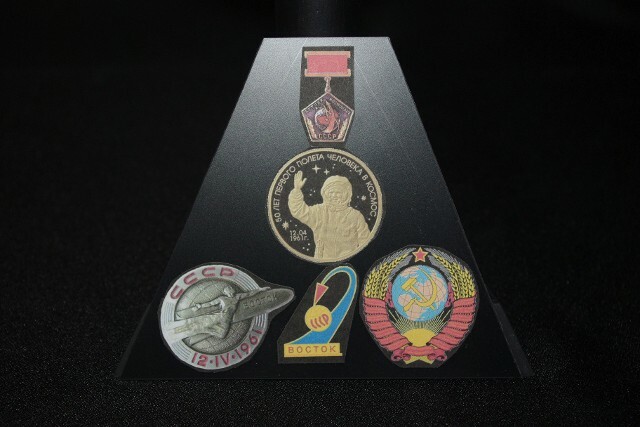 The display stand was also revised to include images of Russian commemorative celebrating the flight. "And now, Comrade, what do you intend to do?" 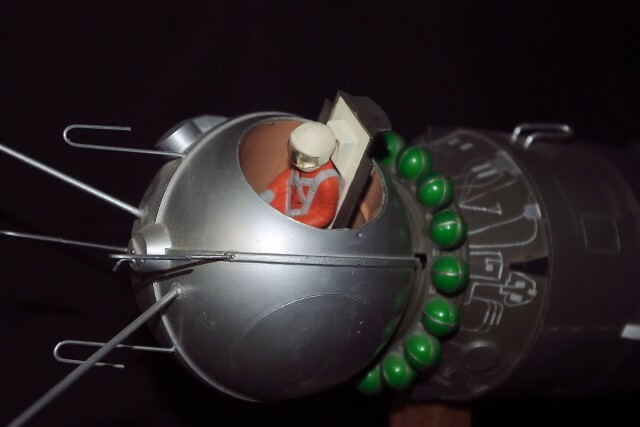 After putting that beautiful "Alclad II" chrome finish on the Sputnik Model and finding the Max Grueter designed Gagarin & Ejection Seat Figure on Shapeways,com, it was almost obvious that a re-build of the Vostok's interior was in order. 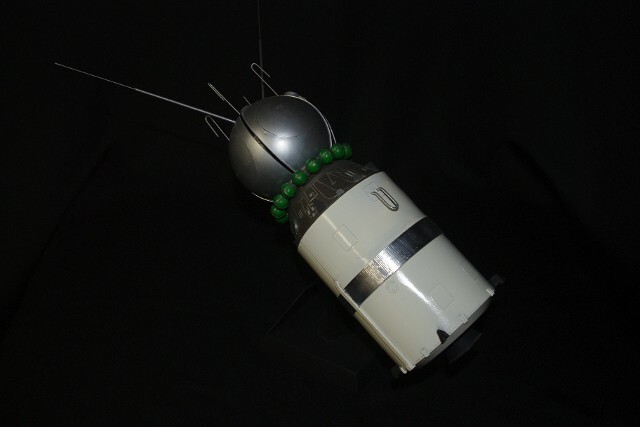 But disassembling the old Vostok looked to risky to attempt, so we decided to do a completely new build. 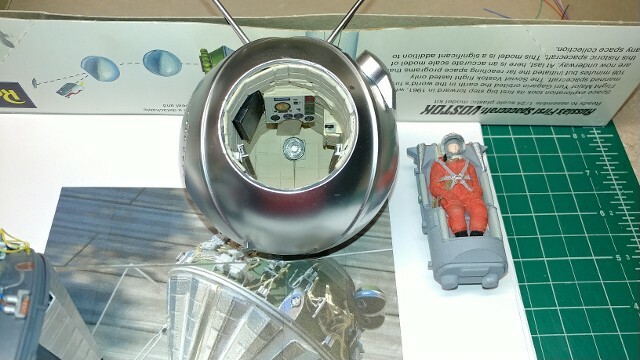 As before, we looked to eBay to find a un-built copy of the Revell 1/24 scale Vostok. We found one where the kit had been "opened" but un-built, and the price was right. 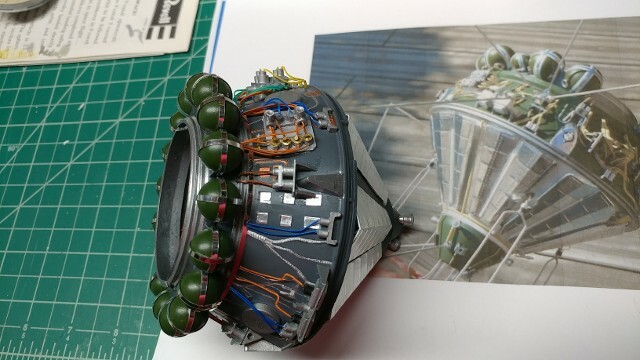 Obviously, the first focus of the rebuild was to configure the cockpit to accommodate the seat rails of the Grueter 3D printed ejection seat and to improve the overall accuracy of the cockpit as well. 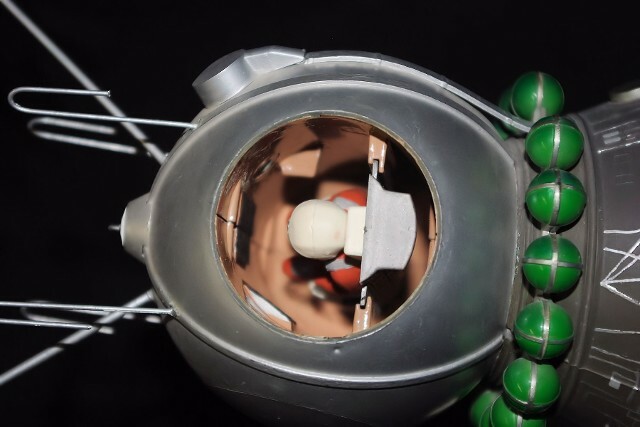 We found good color images of the Vostok's instrument panels, as well as the interior's configuration. We also took some cues from Vincent Meens' work on the same model, in terms of how exterior and interior detailing could be handled. 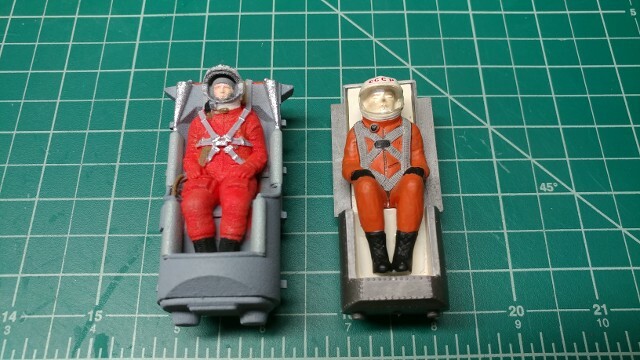 On the left, is the Max Grueter "Small Statues" version of Yuri Gagarin and his Vostok Ejection Seat, 3D printed by Shapeways.com and on the right is the pilot figure supplied with the original Revell model. Obviously, the Revell figure is incorrectly scaled. Plastruct plastic C-channel was used to replace the molded-in seat rails and allow the 3D printed ejection seat to properly fit the cockpit. 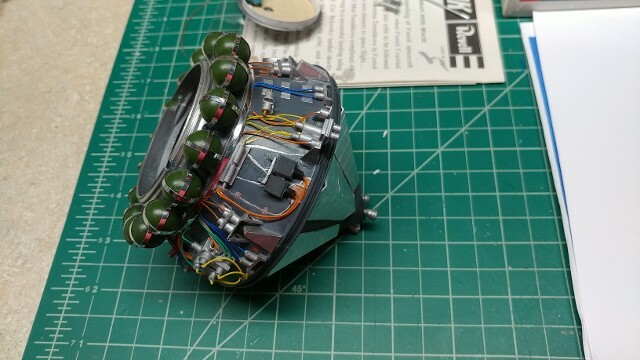 We used scribed styrene sheet to create the "pleated & padded" interior surfaces of the Vostok cockpit. In this shot, you can see how the Cosmonaut relates to the instruments and the switch panel on the left. A manual attitude control handle is also added on the right. 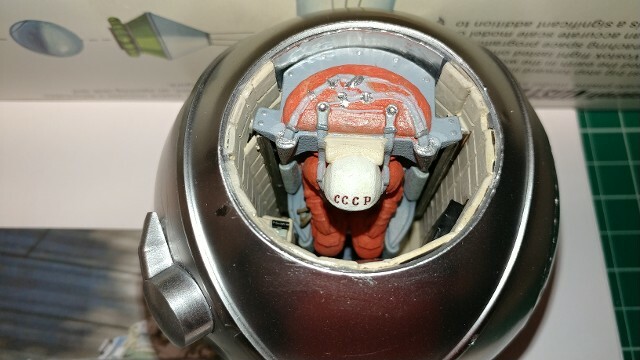 With the Cosmonaut figure withdrawn from the spacecraft, the instrument and switch panel details can be seen a little better. We used Vincent's work on his Vostok to augment the exterior detail of the Service Section of the vehicle. Pipes, wiring runs, relay and valve elements and the radiator panels on the lower-rear surface of the section were added in. The oxygen tank banding is now chromed stripping tape. 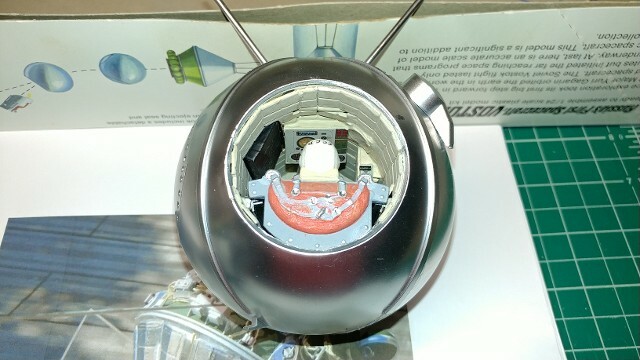 The original Revell-provided display stand was augmented to allow better support and mechanical securement for the model, as well as a section of clear plastic, running up from the base to the support crescent, upon which decals of all of the flight commemorative emblems could be placed. We also borrowed the placement of bolt locations from the Meens' build, using a Dremel bit to create the indentation on the model. 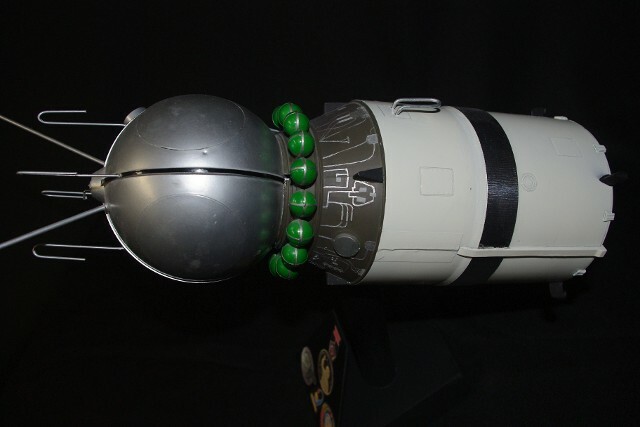 Aluminum duct tape was used to create the silver band around the third stage. 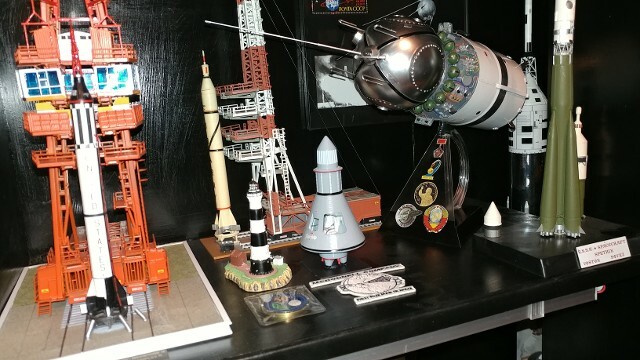 The revised Vostok Spacecraft is now on display on the first shelf of the Apollo Room, where models representing the "First Steps into Space" are gathered. Important to note that while there is a world of difference between the Vostok and today's Soyuz, the rocket they both ride into orbit is essentially the same, except for up-rated booster engines and additional, larger upper stages. Korolev's "R-7" is now the "Soyuz FB Booster" and continues to be the only Russian rocket allowed to take Cosmonauts into space.